Dell PowerVault MD1200 2U 12 bay 3.5 Storage Array, 2xC, 2PS. In good condition and full working order. 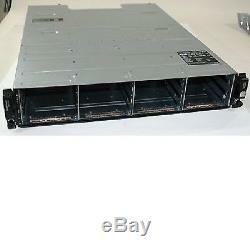 1 x Dell PowerVault MD1200 12-Bay SAS Storage Array Chassis. The MD1200 can be used an expansion array for the MD3200/MD3200i, or can be connected directly to a server using a PERC H800/H810 controller. Dell PowerVault MD1200 direct-attached storage enclosure offers versatility and high-capacity storage for mainstream applications with optimal performance in sequential (streaming) applications. Seamless server and primary storage expansion for 6Gb/s SAS environments. Versatility for investment protection and data tiering. Support for the following configurations. Unified mode (single path) for daisy chaining of up to 8 enclosures per PERC H800 (4 enclosures per port, single path). Unified mode (redundant path) for daisy chaining up to 4 enclosures per PERC H800 (4 enclosures connected to both ports via redundant path cabling). Split mode with dual Enclosure Management Modules providing direct connectivity to drives 0 through 5 and a separate connectivity to drives 6 through 11. 2 Enclosure Management Modules(EMM) provide redundant enclosure management capability. 1 SAS (SFF 8088) "IN" connector for connection to the host. 1 SAS (SFF 8088) "OUT" connector for expansion to an additional enclosure. 1 6-pin UART mini-DIN connector (for factory use only). 1 two-color LED indicator for system status. 2 single-color LED indicators for power and split mode. 1 two-color LED status indicator per drive. 3 two-color LED status indicators: one each for the two EMM SAS ports and one for the EMM status. 1 single-color Unit Identification LED for each EMM. 3 LED status indicators for power supply status, power supply/fan fault and AC status. Two fully redundant power supplies. AC - 600 W; DC 700 W. AC - 2047BTU/hr; DC - 2388 BTU/hr. 100-240 VAC, auto sensing; 48V DC. 8.6 A at 100 V, 4.3 A at 240 V.
28.39 kg (62.6 lb) (maximum configuration). 8.84 kg (19.5 lb) (empty). 10° to 35°C (50° to 95°F) with maximum temp gradation of 10°C per hour. 40° to 65°C (-40° to 149°F) with temp gradation of 20°C per hour. Supports Fresh Air cooling, up to 35 degrees Celsius. 8% to 85% (non-condensing) with maximum humidity gradation of 10% per hour. 16 to 3048 m (-50 to 10,000 ft). 16 to 10,600 m (-50 to 35,000 ft). Refer to RAID Card for details on supported Operating Systems. VAT IS NOT PAYABLE BY PURCHASERS OUTSIDE THE European Union (EU) AND by purchasers in the EU (excluding UK) who are VAT registered. LA 851810x146gb 10k, 36713 10x146gb 10k, 36711 10x146gb 15k, 36712 10 x 146Gb 15k DUP x7. The item "Dell PowerVault MD1200 2U 12 bay 3.5 Storage Array with 2 x SAS 2 x PS Rails" is in sale since Wednesday, February 21, 2018. This item is in the category "Computers/Tablets & Networking\Enterprise Networking, Servers\Network Storage Disk Arrays\Other Network Disk Arrays".